Popheaval: Feeling like discovering new artists? Of course you do. And now there's yet another way to do it! So, here's TuneGlue. It uses data collected by Last.fm and Amazon and hence the recommendations seem to be quite identical to those of Last.fm, but here the information is shown in a visual representation which is always fun and flashy. Let me demonstrate how it works. First you enter one band or artist that you really like. Last.fm, whose database TuneGlue uses, recommends its users artists that are similar to the ones they listen to. Similarly, you can search for new artists in TuneGlue by using your favourite artists. Let's say I'd want to find music similar to The Cure. Next, click the black orb representing the band. 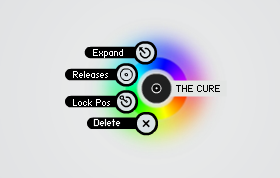 Four options appear: Expand, Releases, Lock Pos[ition] and Delete. Choose Expand. Now, the site shows you six search results that are most similar to the artist you're searching with, according to Last.fm at least. In case of The Cure, the recommendations are New Order, Joy Division, Siouxsie and the Banshees, The Sisters of Mercy and The Glove, as you can see. But that's six possibilities to start listening to, isn't that quite time-consuming? Why, yes it is. But you can easily narrow down the options. Let's say you're also familiar with the music of Siouxsie and the Banshees (one of the recommended artists), and you really like them as well. 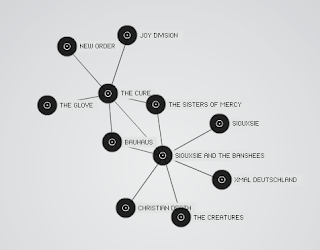 So, you can click their orb, choose Expand, and now you have one chart of similar artists to The Cure and another to the Banshees. 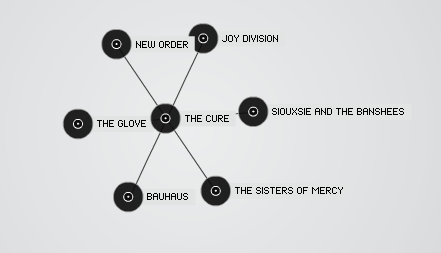 However, as the picture shows, some artists might be connected with both bands - a bit like in The L Word - so in this situation you should probably try either Bauhaus or The Sisters of Mercy as they are recommended to the listeners of both The Cure and the Banshees. 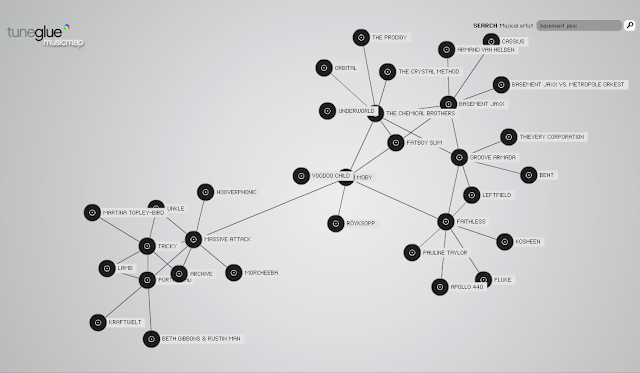 You can expand your recommendation charts as much as you like, as seen from the picture below. They can quickly become rather messy thanks to multiple cross-references, but you can delete unnecessary recommendations simply by clicking them and then selecting Delete, so you can clean up the view by doing that. You can click the pictures to enlarge them. So there you have it, in all its simplicity. Have fun discovering new stuff!